Not sure if your web browser has active geolocation feature? HTML5’s geolocation feature allows website to access your current physical location details (including location Latitude and Longitude parameters). You can easily check if your default browser support geolocation feature and turn it off as per requirement. 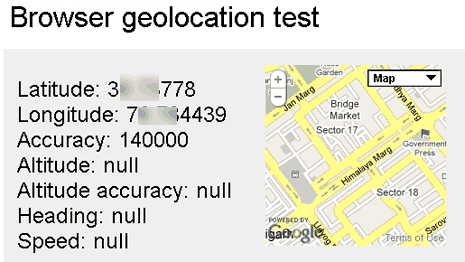 Click here to open website for online test for Geolocation feature in your web browser. If Geolocation feature is not available, you will get message “Your browser does not support geolocation”. If Geolocation feature is available and turned ON, then you will get pop bar at top asking to share your location. Then it will show your exact Latitude and Longitude location along with associated Google Map. If you are not comfortable sharing physical location with different websites through this Geolocation feature, you can always turn it OFF. Checkout procedure to disable Geolocation tracking in Google Chrome and Firefox browser.